Ducati.ms - The Ultimate Ducati Forum > Ducati Motorcycle Forums > HyperMotard > MWR High Effienct lid VS DP + K&N kit ? MWR High Effienct lid VS DP + K&N kit ? Does anyone have clue how big difference there is in the airflow between these two sets ? I mean at some point it doesn`t matter how freely air can flow to engine, because it just doesn`t need more than it can use. Previous owner has installed MWR High Effiency lid. I`m not really sure if it`s a good mod because intake noise is pretty loud (and i`m not fan of intake noise). It`s also pretty open for water. Although they claim foam filter doesn`t let water through and that the performance gain is big. I also have original air filter box with Ducati performance lid and K&N free flow air filter which i`m considering to install. I haven`t heard Hyper with original air filter box. So i can`t say anything about noise of it. Biggest question is if it reduces air flow so much that i have to get it reflashed ?? I have Hyper 1100 and decat pipe, Termignoni mufflers and ecu reflashed. And of course that MWR lid. I have two different air filter configurations an my two air cooled bikes. The intake noise difference that I perceive between those two configurations is not really big IMHO. So I assume that you won't notice a huge difference when riding the bike if you swap your MWR lid with the DP lid + K&N filter. The only option that will considerably mute the intake noise is the closed OEM lid. But I would not recommend going in that direction because you will experience a significant performance reduction. If I were you, I'd keep the MWR lid that is already installed for a few months. You will find out soon enough if any water related problems arise. I personally don't think they will because: 1) The openings on the MWR lid you have are mostly covered by the airbox bottom and the fuel tank. and 2) I have not read about any forum member reporting problems with that lid. I'm going to go out on a limb here and say that the design engineers who work on Ducati power plants know what they're doing and PROBABLY didn't design and implement an airbox/filter that is so restrictive that it robs the engine of power, I'm talking seat of your pants dyno power you can feel. I've screwed around with aftermarket filters and with pods, I've drilled holes (and covered them up again) and re-routed intake scoops in various airboxes, but at the end of the day the power gain is marginal at best. At worst, I know I'm letting a lot more sh#t into my engine by using anything other than a replaceable paper element filter. There has been many studies done on the efficiency of various aftermarket filter technologies, and the bottom line is that none of them work as anywhere near as well as paper for removing fine particulates. And you won't see much difference in airflow between a CLEAN paper filter and, say, an oiled K&N. I believe in fact that's more than often the case especially in today's technology, however on the contrary, I do think that's not always the case with every machine such as with these 1100 air cooled motors. 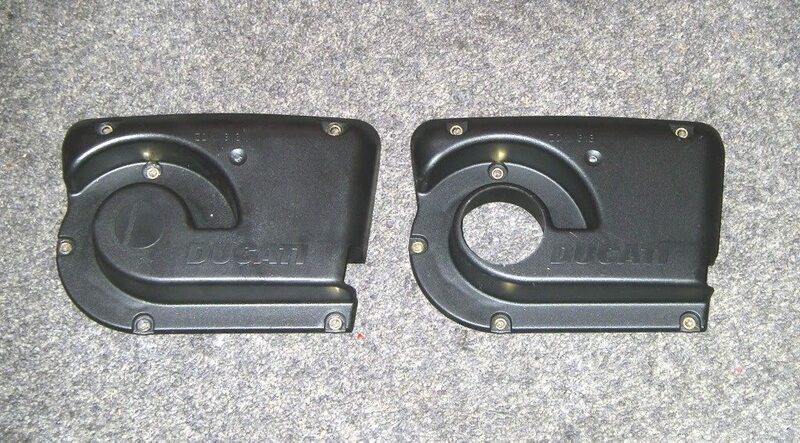 I think if the air box on these were so great to begin with in terms of allowing peak performance that Ducati wouldn't have offered an open style performance lid (pictured below) designed to go along with the performance exhaust and ECU in the first place. While it is not anything near substantial as a set of velocity stacks, an increased flow design that came as an option from the manufacture tells me that there is some performance potential to be had over the closed lid even if you don't believe in anybody's dyno graphs to prove it. The MWR lid as referenced in this thread is going a step further over the DP open style lid. If you do some Google searching for velocity stacks on the air cooled Ducatis, you'll see many proven results of the gains, in most cases pretty substantial too. I am sorry to come out with this post but to say they don't make any gains properly setup and tuned on these bikes is false. I've screwed around with aftermarket filters and with pods, I've drilled holes (and covered them up again) and re-routed intake scoops in various air boxes, but at the end of the day the power gain is marginal at best. Simply clamping a pair of K&N pod filters to the throttle bodies is not the same thing as velocity stacks, and, you have to have the engine re-tuned in order to properly see the gains as well. For example, the oversized CA-Cycleworks tank for the 1st gen Hypermotard requires removal of the air box with the replacement of a set of (small) pod filters you clamp to the throttle bodies directly (no stacks). This actually results in a slight decrease in performance over the factory air box. Again, you can research this however I think you'll agree on this from your experience. There has been many studies done on the efficiency of various aftermarket filter technologies, and the bottom line is that none of them work as anywhere near as well as paper for removing fine particulates. And you won't see much difference in airflow between a CLEAN paper filter and, say, an oiled K&N. I am in the same mindset. No doubt that it depends upon the type of riding you do and the particular style of bike. Velocity stacks on an air cooled ADV based Multistrada (like your signature states you own) would probably be the wrong bike to install them on if you're riding on gravel roads where there are a lot of dusty conditions, etc. 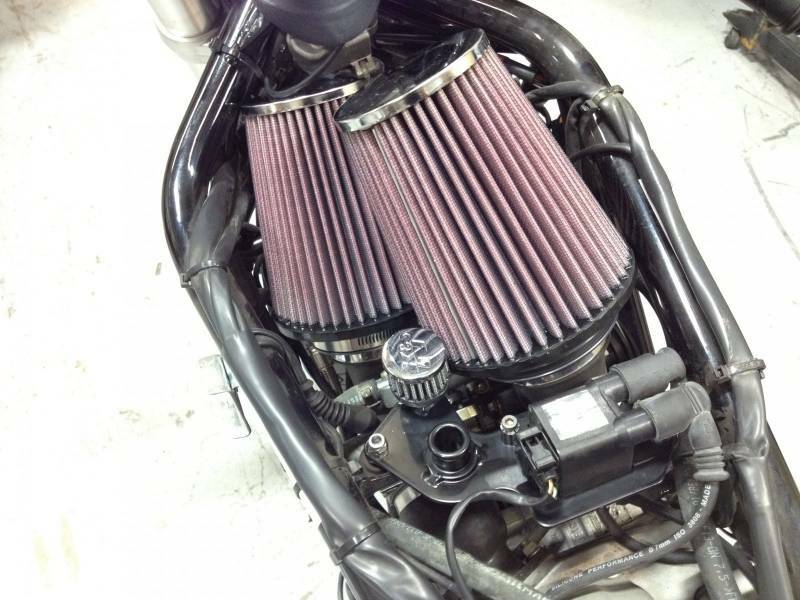 If you primarily ride on the street and more importantly maintain the filters regularly , it's usually not an issue. Must one do intake modifications to their Hyper and am I saying you should get rid of the airbox? Not all, these bikes do ride fine (although a good tune no matter the configuration can work wonders on a Duc!) with the stock box untouched. My point is that on these particular bikes, the air box is not achieving peak performance and the results are out there all over the place to prove it, myself included. Last edited by Austen; Apr 12th, 2019 at 11:53 am. Ya, I agree I made some generalizations that don't bear up in specific circumstances. I do agree there are some (significant) gains to be had with velocity stacks when done right, but the open cover in the OP's post won't do much without some tuning. At the very least some changes to the fueling map need to be made; the DP cover in your post is designed to be used in conjunction with a more free flowing exhaust and DP ECU. A lot of riders seem to hop onto the "more air is better" idea without considering that they may end up running hot/lean with marginal (or no) power gains. I do own the MTS in my sig, and I'm in the process of converting it to 60/40 offroad with tires, raised mudguard, belly pan, etc. so NOPE I won't be running pods on this guy! Good info in your posts, didn't mean to lead anybody astray. You guys have already covered this pretty well and I think we are more or less in agreement, but I will just add a quick two cents of my own. Yes, the engineers at Ducati know a hell of a lot more than any of us about intake charge dynamics. However they are optimizing within a set of constraints which may or may not apply to my situation. This includes legislation regarding sound and emissions, as well as cost structures. So while I generally err on the side of OEM, you only need to look at any amateur race bike to see the how there is more performance to be had, be that braking, suspension, or power, by replacing OEM parts with tested and proven aftermarket. Plenty of people take the same look and conclude that their street bike must look as much as possible like a race bike or that their Honda Civic will benefit from a Pep Boys fart can exhaust, which I personally think is a waste of money and a great way to turn a competent vehicle into something unusable. However, in the specific example of intake and exhaust mods for the 1100 platform(paired with appropriate ECU tuning) you can find plenty of dyno graphs on this forum that show real, significant gains. I will also add that I have the same MWR intake cover on my 900SS and have ridden through nasty mud puddles that splattered the airbox top to bottom with wet road grime; upon opening, it was clean as a whistle inside. So I am not personally concerned about diminished filtration performance. Austen and [email protected] like this. Interesting conversation and opinions. Thanks everybody ! At this point I`m forced to use the MWR lid one more season. Previous owner has taken the small bolt-pins that attact the air box to frame from OEM air box. And he has broken thread from both bolts by screwing them on wrong thread. So they can be fixed to MWR box but if I change them to OEM box it would kill the threads from the box Getting new ones takes 2-8weeks. Honestly all this hassle with foam filters really isn`t worth of the extra HP for me. Cleaning the filter and oiling is messy and costs. Every cleaning costs about 18€ (20,4$) and oil costs same. Of course oil bottle lasts 3-4 oilings. I bought spray oil and it was bad idea. It`s impossible to spray smooth layer everywhere. Thank god i tried it first in piece of foam. Now i`m gonna get just regular bottle. OEM paper filter costs about 20€ and is just plug&play job. Throw old to trash and but new one in place, that`s it.